Shinto: Jyo Saku: Wazamono cutting test ranking: Musashi province. This blade belongs to Jyo Saku ranking. Blade length : 63.3 cm or inches. Sori : 0.8 cm or inches. Width at the hamachi : 3.27 cm or inches. Width at the Kissaki : 2.24 cm or inches. Kasane : 0.71 cm or inches. Shape The blade is wide and thick with small sori and longer kissaki healthy blade. Jitetsu :Koitame hada well grained with jinie attached. There are some rough texture on the Shinogi-Ji and Mune side. Hamon:Niedeki suguha with small ashi and yo work. Boshi is round shape hakikake style. of Horikawa Kunitake in Kyoto. It is said that they were descendants of Sanjo Yoshinori. in 1694 and his adopted son succeeded Yoshitake as the Second. Tsuba : Mokko shape iron Tsuba, ship is engraved. Fuchikashira : Copper, cherry blossoms are engraved. Saya : Black Roiro Saya. Menuki : Brass, dragon is engraved. 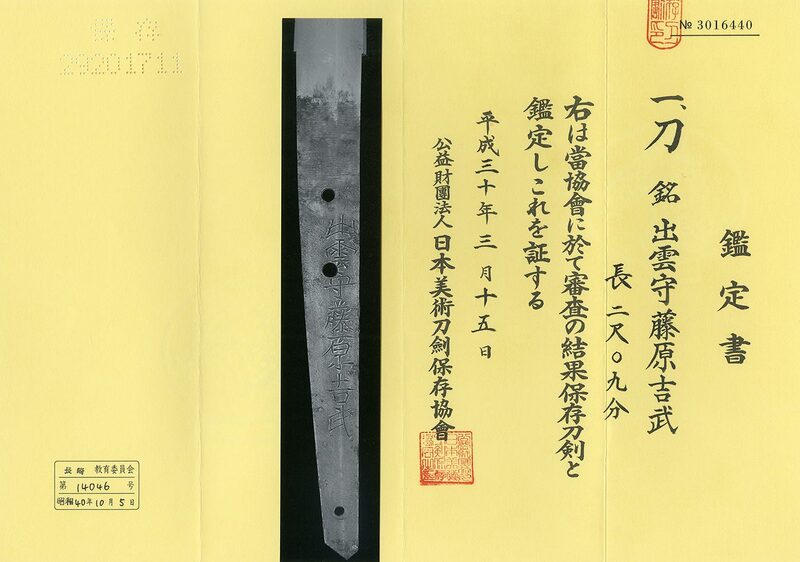 There are some black colors peeled off around the Koikuchi of Shirasaya. From Aoi Art: This blade has some rough texture on the Shinogi-Ji and Mune. But the blade is wide and thick, and already passed the NBTHK Hozon Paper. The Koshirae is also good.